Conspiracy of domestic microenvironment, bacterial stress response and directed mutagenesis towards antimicrobial resistance: Lessons for health care. Citation: Ebinesh A. Conspiracy of domestic microenvironment, bacterial stress response and directed mutagenesis towards antimicrobial resistance: Lessons for health care. J Infectious Disease Med Microbiol. 2017;1(1):1-3. Bacterial survival in any environment is in fact challenging. The environmental factors around these single-celled organisms are widely variable. These variations in the adjoining microenvironment of bacterial survival vary between the spectrum of factors that favour bacterial survival and those which endanger their existence. The ability of bacteria to sense these lethal threats and to effectively respond to these threats determines their probability of survival . The inherent potential of bacteria to withstand such adverse factors is believed to be explained by the theory of natural selection. This theory of evolution describes the phenomenon of antimicrobial resistance (AMR) as stochastic or deterministic selection of bacterial cells following exposure to stresses. A strong intimidation to health care in the recent decades is the emergence of antimicrobial resistance. The occurrence and isolation of multi-drug resistant, extensively-drug resistant and pan-drug resistant strains have been reported across the globe . The burden of AMR has attained such a level that the scientists are in search of alternative modalities to curtail the menace of infectious pathogens. These alternative modalities include bacteriophage mediated bacterial clearance, reinforcing the human microbiome, genetically modifying bacteriophages to deliver antibiotics and exploiting bacteriophages in tuning microbiome [3-5]. AMR is a significant concern for any physician or a surgeon with respect to nosocomial infections. The issue of AMR is intensified in the management of nosocomial infections where the pathogens have acquired resistance to almost all known antibiotics without even sparing a handful of options. However, in the recent years AMR has also been posing threat in managing communityacquired infections. It is indeed a question whether such degree of AMR is attributable to random selection of specific bacteria as explained by the theory of natural selection. Hence, it demands a still valid explanation for further exploration and curtailment of this issue. The environment of bacterial persistence is dynamic with waves of alterations. Stress is any external factor which endangers the survival of an individual bacteria or a bacterial population resulting in altered sub-cellular metabolism characterized by inhibition of cell proliferation, fall in bacterial count in a population and decline in growth rate. When extreme degree of such stresses act on a bacterial population, the population enters the phase of decline with reduction in viability. Another spectrum of consequence of stress exposure can be the successful persistence of bacteria through the adversity. Exposure to imbalance of ecological factors brings about a sequence of specific and non-specific adaptive responses that ensure bacterial survival . These responses involve complex sub-cellular genotypic and phenotypic alterations. It can be hypothesized that these complex alterations impact the susceptibility of bacterial cells to antibiotics . The influence of environmental stress on food-related pathogens such as Escherichia coli, Staphylococcus aureus, Listeria monocytogenes and Salmonella typhimurium has been extensively studied [8-10]. These studies have demonstrated that stress exposure reduces the susceptibility of bacterial cells to antimicrobial agents. These studies have also proved the emergence of AMR even in absence of antibiotic exposure which questions the validity of the theory of natural selection. Evolution of AMR in absence of antibiotics is a consequence of adaptive responses to domestic environmental stresses that ensure its survival. The frequent occurrence of multidrug resistant pathogens in health-care settings has been recorded worldwide. Health-care environment is an ecosystem comprising a confederation of stresses which elicit a strong protective response in the bacteria which includes complex, specific and non-specific genotypic and phenotypic alterations that also determine its susceptibility to various other adverse factors. Concurrently, exposure to environmental stresses confers resistance to antibiotics. This adaptation is observed owing to the action of various stress proteins like sigma factors (eg., σB, σX, σE, etc) and two-component systems (e.g., AmgRS, CpxRA, BraRS, etc). These stress-response systems initiate modifications in the gene expression leading to the expression of proteins like MexCD-OprJ (an efflux pump) which confer resistance to antibiotics. Exposure of bacterial cells to stress activates stress-response systems that initiate a myriad of genotypic alterations Figure 1. These genotypic changes that result in formation of a physiologically and phenotypically heterogeneous population of bacterial cells that possess the ability to resist a variety of stresses are constitutively called directed mutagenesis. Directed the mutagenesis is a state of hypermutability characterized by selective gene amplification, elaboration of resistance genes, and increased frequency of genetic transfer and recombination. Ultimately this results in a population of dormant persisters that are potentially resilient to multiple stresses . 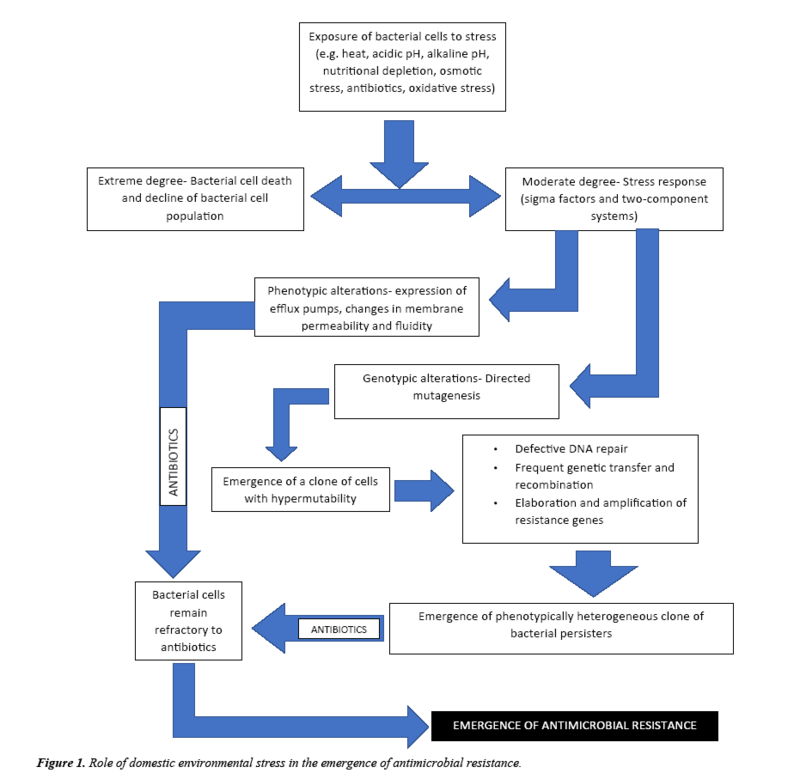 Figure 1: Role of domestic environmental stress in the emergence of antimicrobial resistance. The impact of domestic environmental stress on the bacteria depends on the intensity of stress. If the stress is highly intense, it results in bacterial cell death. While a moderate intensity of stress elicits a stress response. The stress response involves the activation of stress-response systems comprising of a system of stress induced protein in a specific sequence. These stress-response systems bring about genotypic and phenotypic alterations in the bacterial cell that enhance the chance of its survival. The phenotypic changes include alteration in membrane fluidity, reconstitution of membrane cholesterol, expression of efflux pumps, etc. All the genotypic changes result in a state of hypermutability called directed mutagenesis which includes amplification of resistance genes, increased frequency of genetic transfer and recombination, etc. As a consequence of these alterations, a population of physiologically and phenotypically heterogeneous bacterial cells is formed. When a collection of such clones of bacterial cells are exposed further to antibiotics, these cells remain refractory .i.e. these bacterial cells are resistant against antibiotics. Hence, exposure to environmental stress promotes the emergence and spread of antimicrobial resistance. According to the concept of directed mutagenesis, persistence of bacteria in an environment bloated with stresses enhances the chances of emergence of antimicrobial resistance. In health care sector, the intense burden of AMR is encountered in an intensive care setup. An intensive care environment is a typical example where the bacteria undergo frequent and wide variations in environmental factors. These variations bring about an ecological disequilibrium in the microenvironment of bacterial survival and hence elicit a strong protective response. This makes it clear that, persistence of bacteria in an intensive care environment promotes the emergence and elaboration of AMR. This also explains the occurrence of multi, extensive and pan-drug resistant organisms in an intensive care environment. Tackling this issue lies in our ability to create a sterile environment which is obviously hypothetical. Though, achieving a sterile environment is hypothetical, it might be possible to achieve a near-sterile environment. However, this might rise a question, how much sterile is actually sterile? In other words, the current scientific literature neither provides any exact definition for cleanliness nor describes any unit to measure cleanliness. This calls for methods and modalities to measure cleanliness. Hence, guidelines describing the levels of cleanliness beyond which interventions are required, recommended interventions to ensure adequate levels of cleanliness and methods to monitor cleanliness should be prescribed. Ensuring and monitoring regular and periodic cleaning of surfaces, sterilization of instruments, disinfection of articles and fumigation of the intensive care units are the currently available choices to improve the outcomes. The interface of communication between the action of stresses and the action of antimicrobial agents is quiet complex to understand. But instigating efforts to precisely understand the bacterial stress response and its impact on antimicrobial susceptibility will aid in the furtherance of existing knowledge about the emergence and spread of antimicrobial resistance. Precisely studying these molecular mechanisms can also aid us in discovering foci for intervention to inhibit this response. Designing novel chemotherapeutic agents that interfere with the bacterial stress response system will hamper the emergence and spread of antimicrobial resistance. These agents can also be expected to serve as better adjuvants to antibiotics. Therefore, further insight into the functioning of bacterial stress-response systems and their resultant influence on antimicrobial action is very much essential. Boor KJ. Bacterial stress responses: What doesn’t kill them can make them stronger. PLoS Biol. 2006;4(1):e23. Ebinesh A, Kailash TV. Bacteriophage-mediated microbiome manipulation: A novel venture in fostering infant gut health. Int J Med Biotechnol Genetics. 2016;4(1):34-9. Ebinesh A, Kailash TV. Horizon of new hope towards a robust infantile gut: Advent of bacteriophages in tuning gut microbiome. Arch Clin Microbiol. 2016;7(5):27. Westwater C, Kasman LM, Schofield DA, et al. Use of genetically engineered phage to deliver antimicrobial agents to bacteria: an alternative therapy for treatment of bacterial infections. Antimicrob Agents Chemother. 2003;47(4):1301-7. Poole K. Bacterial stress responses as determinants of antimicrobial resistance. J Anitmicrob Chemother. 2012;67(9):2069-89. Dorr T, Lewis K, Vulic M. SOS response induces persistence to fluoroquinolones in Escherichia coli. PLoS Genet. 2009;5(12):e1000760. McMahon MAS, Xu J, Moore JE, et al. Environmental stress and antibiotic resistance in food related pathogens. App Environ Microbiol. 2007;73(1):211-17. Faezi Ghasemi M, Gazemi S. Effects of sub-lethal environmental stresses on cell-survival and antibacterial susceptibility of Listeria monocytogenes PTCC1297. Zahedan J Res Med Sci. 2015;17(1): 1-6. Al-Nabulsi AA, Osaili TM, Shaker RR, et al. Effects of osmotic pressure, acid or cold stresses on antibiotic susceptibility of Listeria monocytogenes. Food Microbiol. 2015;46:154-60. Harms A, Maisonneuve E, Gerdes K. Mechanisms of bacterial persistence during stress and antibiotic exposure. Science. 2016;354.